^ Mini Joseph Tejaswi (18 July 2012). "Accenture in India". Articles.timesofindia.indiatimes.com. Retrieved 10 August 2013. ^ "Apple and Accenture partner to create iOS business solutions". Apple Newsroom. Retrieved 31 August 2017. ^ "Accenture Total Assets 2006-2018 | ACN". www.macrotrends.net. Retrieved 29 October 2018. ^ "Accenture Consulting". 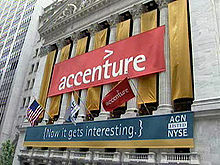 www.accenture.com. Retrieved 2 September 2015. ^ "Best Global Brands 2018 Rankings". Interbrand. 2018. Retrieved 6 February 2019. ^ Alsop, Ronald. "Transgender, at the office". Retrieved 16 April 2018. ^ "America's Best Management Consulting Firms 2017". Forbes. Retrieved 16 August 2017. ^ "World's Most Admired Companies". Fortune. 2019. Retrieved 1 February 2019.